Oh crikey, more posts in the middle of me getting mine together! Sometimes it was marked Mdina on the bottom before Michael Harris left. Sometimes, if you're very, very lucky, it's actually written by him. Often in a lovely round, highly polished pontil mark. Sometimes Eric Dobson's handwriting can almost be discerned (I haven't had this confirmed yet) and smetimes it's just a normal loopy Mdina. Or not. In the beginning, it was all very, very random how (or almost even if), a piece was finished off. They were exceptionally busy, keeping up with orders and keeping the shop stocked. Whether or not a piece was finished, and how, depended on somebody available having the time to do it. Wow Sue, what a lot of super pictures. Could you put some of them either on here or on the Glassgallery, so they won't disappear in years to come when other people look up this thread. However, that does not quite fit with the statements in Michael Hill's book about the Mdina signature. I am now confused! Was that paper label with the St Thomas's Tower used after Harris left as well as before? Is it true that "thick" Mdina signatures came in after Harris left (indicated in Hill) whereas before then the signatures were "thin"? And what do you make of this? 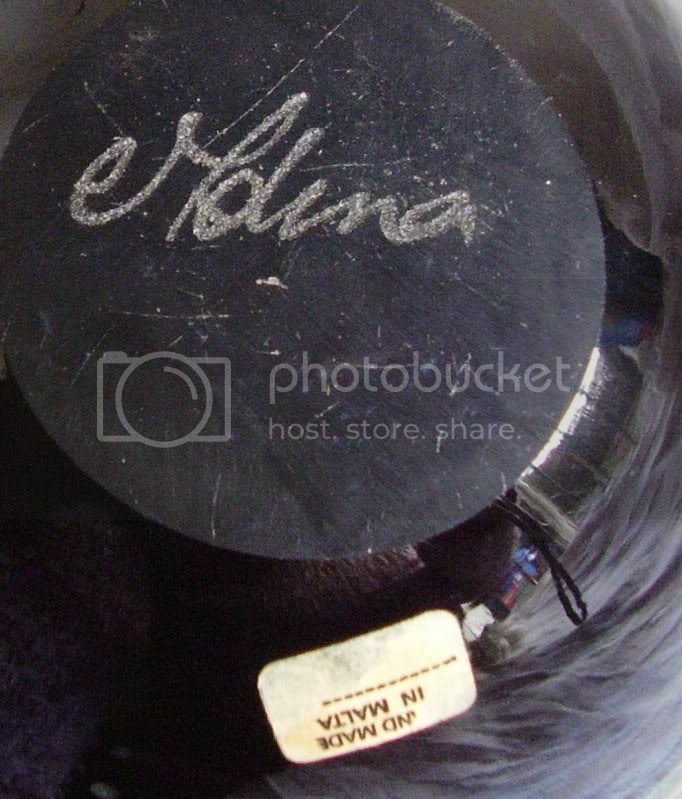 (it has a big loopy M that you can't see properly at the start of the signature. I would imagine Mark Hill's statements are the most accurate available, given he worked with the Harris family to write his book, and it has their seal of approval. However, I think Andy's comments probably refer to Michael Harris' resistance to putting his own signature on pieces, unless it ws specifically requested. Elizabeth Harris also told me, some years ago, that he sort of lost interest in a piece as soon as it was finished - he was simply so eager to get on and see what he could do next, in the true spirit of the family slogan - "Our best work will be done tomorrow." He was a complete workaholic. I believe certain ranges were signed by him, at the specific request of some American import companies - and a lot of the "Rosenthal" range was signed because of this, despite the fact that the major order never really came to fruition. I believe the paper labels were used both before and after he left. Sometimes there are rectangular labels with numbers written on in biro - these refer to order numbers. The label is sideyways long, rather than upright. 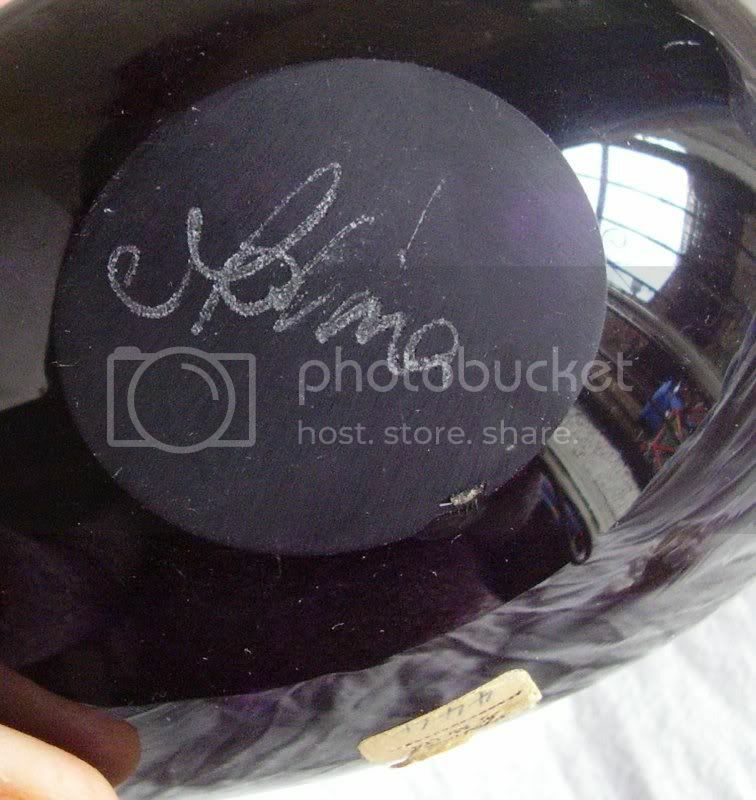 I have also noticed that most of the "Japanese" globe vases are signed by him. Going over my collection some time ago, I started to try to catalogue all the various scripts used, but then I got ill, and all the lifting, shifting and bending became impossible, but I'd identified over 25 different kinds of handwriting, and it's very much all in the same time frame as the pieces in Mark's book. I hardly have any of the "splodgy" stuff, which was not Michael Harrris' design - I think that was Joseph Said, as are the seahorse PWs. Basically, absolutely nothing was set in stone or standardised. You have to date the glass by the style and the shapes and the colours. 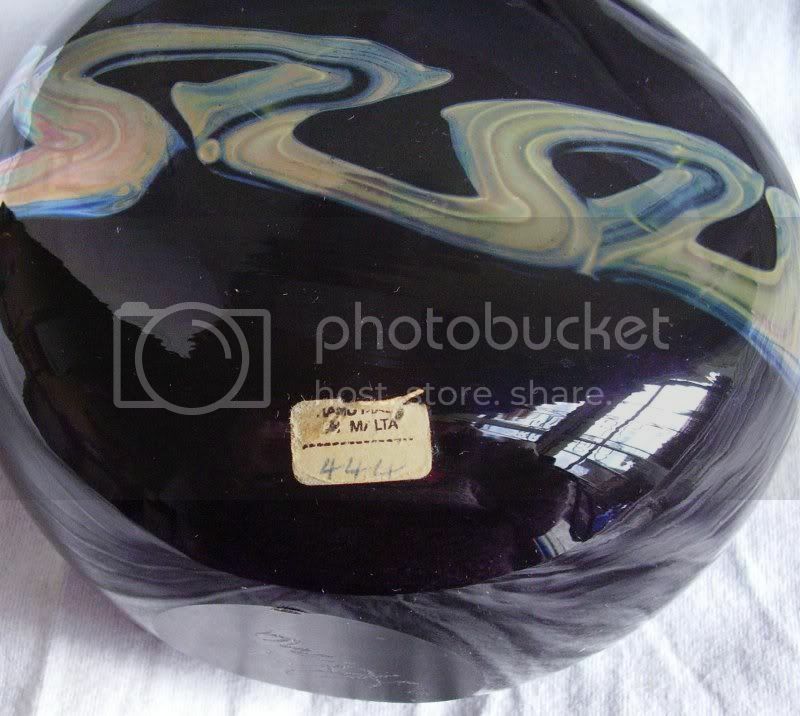 It was the late '60s, hot glass worked by individual artists in small studios was a new and exciting medium, Michael Harris was more interested in learning what he could do with it than regulating marks on it. I would love to be able to put the images in glass gallery, but I simply cannot resize them - I'm a technodinosaur - I can't follow all the steps of how to do it, (short-term memory problems as well as a body which doesn't work properly - I've got ME) which is why I use photobucket. 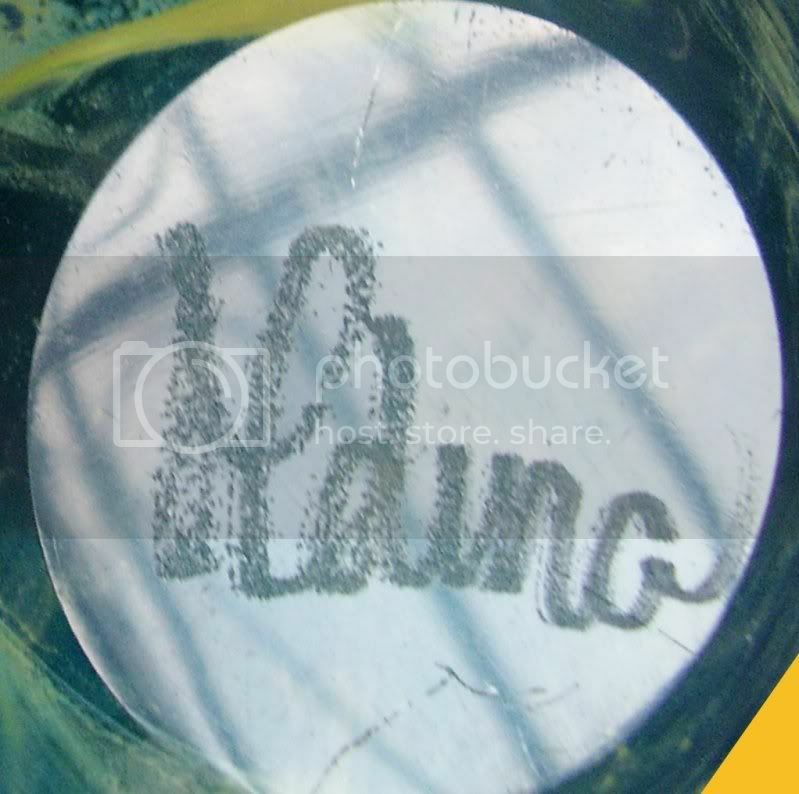 But if anybody can use the photobucket images to put them in the gallery, that's fine by me! Fantastic replies Ladies-so much information to absorb!! Not forgetting those lovely items from Sue. Many, many thanks to all for your time and sharing. regards Carol-dawn promises to be a fine day-I bet its hot though! Re-reading all of this, sorry, Angela, I forgot to say anything about thin versus thick marks, and to comment on the mark on your blue and pink piece. I think what is meant by "thick" is where the dremmely/drill thing did a sideways sort of thing, which does result in a very thick line to the writing. This comes in around the same time as the splodgy stuff, while earlier - but also later - they used a thinner script. 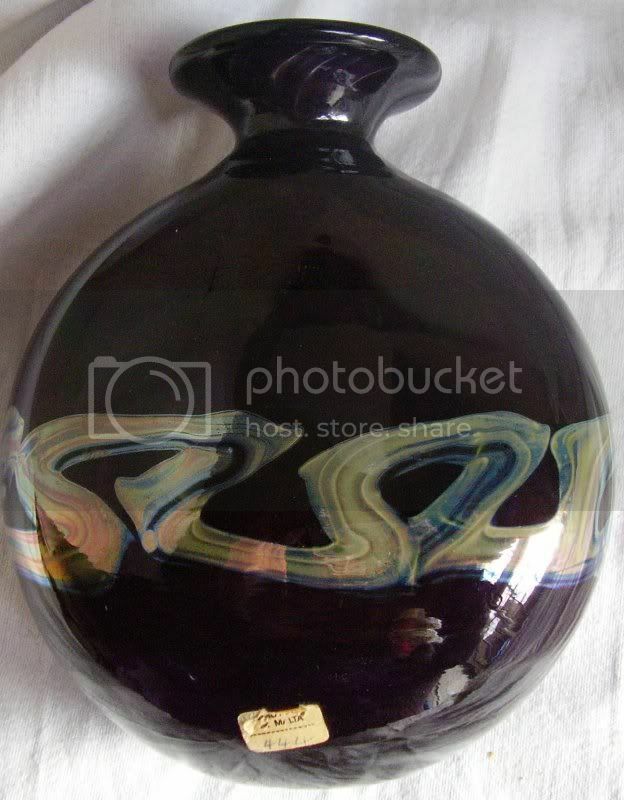 I have seen this mostly on things such as the hexagonal tall decanters with pink splodges and blue trailing. Several of the different "hands" which did the writing all tried to keep to a big loopy M at the beginning, fairly straight up and down "posts", with the small "v" part looking more like a capital U suspended between them, and a fairly similar style of writing too - it's only when you compare them you really notice they're actually different. Much later on, into the '90s, the script is much smaller and decidedly italic. This is often described as reading "Molina" - the bits of the "d" come apart. This tends to occur in conjunction with the plastic labels, if you've got a label. Sadly this means that, as I have seen recently, somebody unconnected with Mdina has recently tried to copy it, along with the words Michael Harris, onto the base of a bit of glass which was most decidedly not by him - wrong style, wrong shape and not his design! However the shakiness of the writing gave it away - along with everything else! You clearly have a huge collection and a vast store of knowledge, Sue. Would you like to share some of those pictures of the signatures? I'd particularly like to see a "thick" signature. 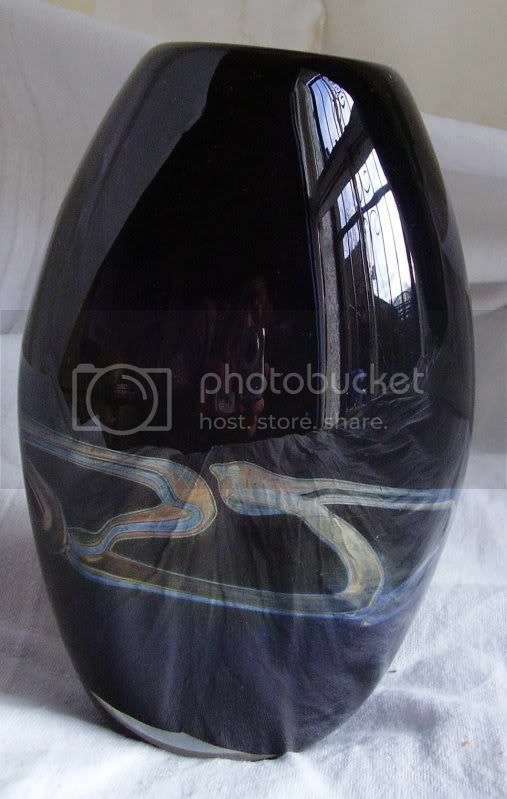 In fact, would you like to work with me on an article for the Glass Museum (www.theglassmuseum.com) about Mdina? I've been collecting material for a long time but never get around to actually doing it. Would my blue and pink piece be what you refer to as "splodgy pieces"? If not, does it belong to another series? And here is one of Sue's pictures of an Earthtones Chalice. 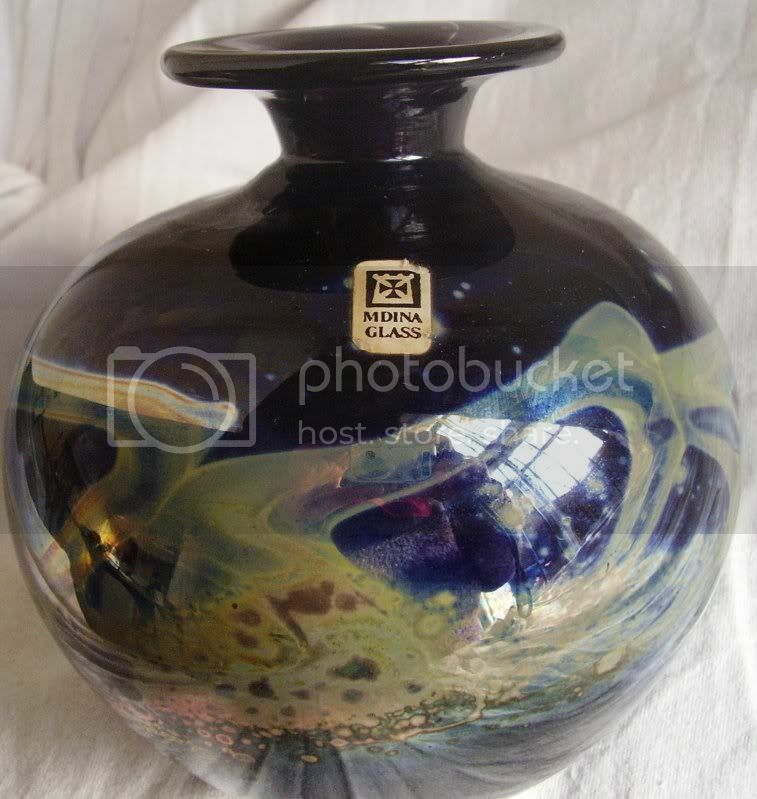 Just thought i would add, there seems to be a surge of mdina items with MH on them (ive seen 3 now in the last 6 months, one on ebay and 2 at large fairs) being sold as Michael Harris pieces. The pieces ive seen have all got the genuine mdina script on them but the MH added at a later date by an unconnected person. After picking Ron Wheeler brains and reading the various books mentioned this is my understanding of the various signatures seen. First, Andy McConnell states only that the dremmel was used after 1972, not nothing was used before. After Mr H left Mdina a dremmel was used to sign items resulting in a thicker mark being produced often with the looping signatures we see often. For labels have a look here http://glassgallery.yobunny.org.uk/thumbnails.php?album=546&page=1, just realised I have one not in the gallery so will add that later. To be honest, I don't actually know what a dremmel is or how it works, but Michael Harris was a very fine diamond point engraver indeed, well before he started working with hot glass. Thanks for all that extra stuff, and pics, John! I see you've got an image of a tall rectangular label with a written on bit. I'm afraid my memory needs a lot of prompting. I was discussing this particular Earthtones pattern with Ron, he suspects they may have been made by Joseph Said. I would suspect he's correct - I've got one of those cube shaped vases with it, which is not, to my knowledge, a Michael Harris shape. I don't have, to hand, images of the various scripts, Angela, and I did manage to pack a load of stuff away last year (OH getting just a tad fed up of tripping over glass) but I will see what I can do. I'm afraid I'm slow, very limited in any activity at all and it all has to be accommodated around trying to manage basic "life" stuff. 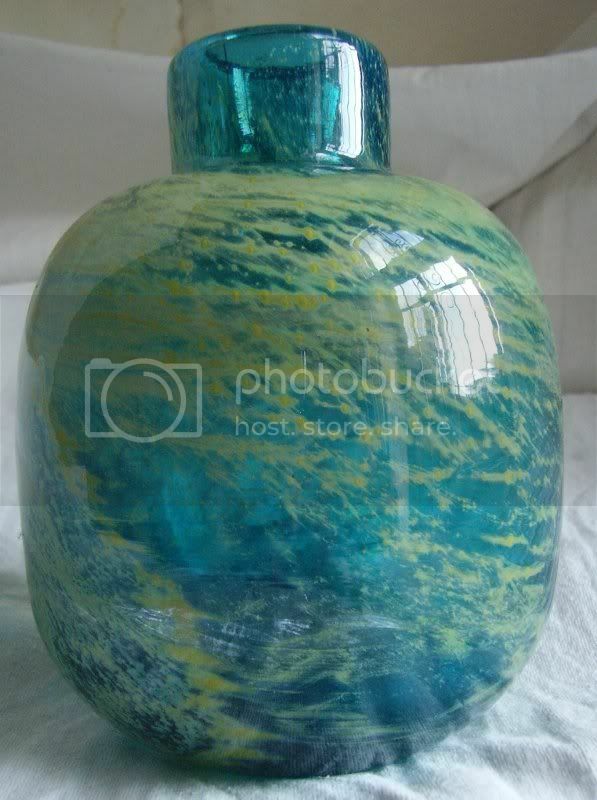 There are a good few images of some wonderful stuff in another thread a while ago - while we were discussing cobalt faceted inside-out vases. Long thread - got blethering Mdina and Michael Harris, my favourite subject! I'd happily work with you on an article Angela - but it might take time - and there are other folk with input around too - and their prompting helps me a lot! And yes, your blue and pink piece is what I call splodgy. John showed a tall rectangular label with numbers written on it, this is the wide one I've seen. It's on a later range, (one I think they may still produce - it certainly was in their website within the last few years, although the pieces I have seem to all have paper labels). 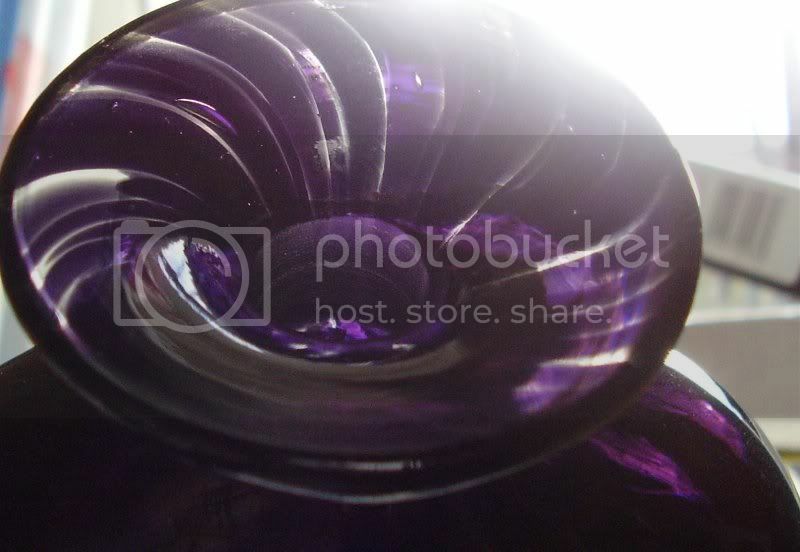 These vases use a completely different shade of purple to the amethyst of the early pieces. It is splodged heavily, to create the appearance of black. the script on these is similar to the one I desribed before, as being italic-y, and reading "Molina", but this is one is much bigger than the one which appears with plastic labels. 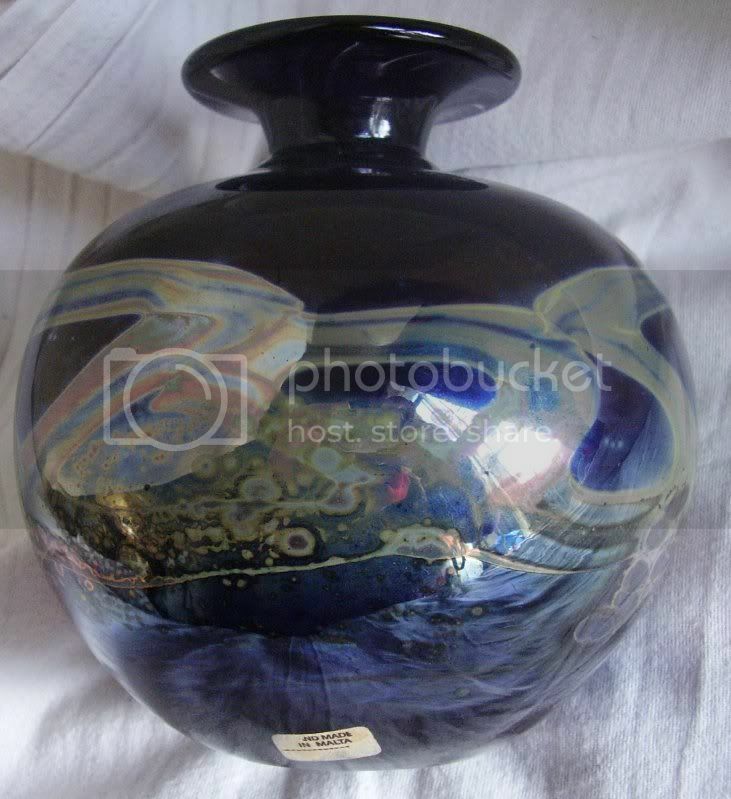 And an unmarked, unlabelled "egg" vase in this range. Page created in 0.676 seconds with 27 queries.